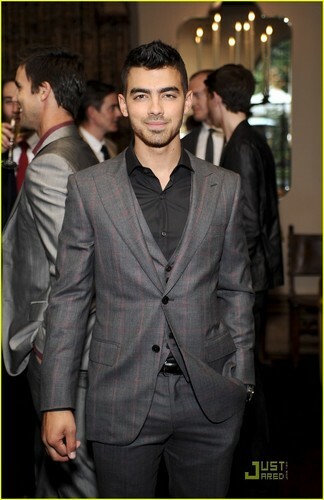 Joe Jonas: Private ডিনার with Simon Spurr (05.10.2011). Joe Jonas snaps a pic with designer Simon Spurr as they gather at the অট্টালিকা Marmont for a private ডিনার in his honor on Tuesday night (May 10) in Los Angeles.. HD Wallpaper and background images in the দ্যা জোন্স্‌ ব্রাদার club tagged: joe jonas joe jonas hot 2011. Joe Jonas snaps a pic with designer Simon Spurr as they gather at the অট্টালিকা Marmont for a private ডিনার in his honor on Tuesday night (May 10) in Los Angeles. This দ্যা জোন্স্‌ ব্রাদার photo contains ব্যবসা উপযোগী, মামলা, জামাকাপড় মামলা, and তিনটা স্যুট.